The Dakota War of 1862, also known as the Sioux Uprising, (and the Dakota Uprising, the Sioux Outbreak of 1862, the Dakota Conflict, the U.S.–Dakota War of 1862 or Little Crow's War) was an armed conflict between the United States and several bands of the eastern Sioux (also known as eastern Dakota). It began on August 17, 1862, along the Minnesota River in southwest Minnesota. It ended with a mass execution of 38 Dakota men on December 26, 1862, in Mankato, Minnesota. Throughout the late 1850s, treaty violations by the United States and late or unfair annuity payments by Indian agents caused increasing hunger and hardship among the Dakota. Traders with the Dakota previously had demanded that the government give the annuity payments directly to them (introducing the possibility of unfair dealing between the agents and the traders to the exclusion of the Dakota). In mid-1862 the Dakota demanded the annuities directly from their agent, Thomas J. Galbraith. The traders refused to provide any more supplies on credit under those conditions, and negotiations reached an impasse. On August 17, 1862, one young Dakota with a hunting party of three others killed five settlers while on a hunting expedition. That night a council of Dakota decided to attack settlements throughout the Minnesota River valley to try to drive whites out of the area. There has never been an official report on the number of settlers killed, although figures as high as 800 have been cited. Over the next several months, continued battles pitting the Dakota against settlers and later, the United States Army, ended with the surrender of most of the Dakota bands. By late December 1862, soldiers had taken captive more than a thousand Dakota, who were interned in jails in Minnesota. After trials and sentencing, 38 Dakota were hanged on December 26, 1862, in the largest one-day execution in American history. In April 1863, the rest of the Dakota were expelled from Minnesota to Nebraska and South Dakota. The United States Congress abolished their reservations. The United States and Dakota leaders negotiated the Treaty of Traverse des Sioux on July 23, 1851, and Treaty of Mendota on August 5, 1851, by which the Dakota were forced to cede large tracts of land in Minnesota Territory to the U.S. In exchange for money and goods, the Dakota were forced to agree to live on a 20-mile (32 km) wide Indian reservation centered on a 150 mile (240 km) stretch of the upper Minnesota River. However, the United States Senate deleted Article 3 of each treaty, which set out reservations, during the ratification process. Much of the promised compensation never arrived, was lost, or was effectively stolen due to corruption in the Bureau of Indian Affairs. Also, annuity payments guaranteed to the Dakota often were provided directly to traders instead (to pay off debts which the Dakota incurred with the traders). At a meeting of the Dakota, the U.S. government and local traders, the Dakota representatives asked the representative of the government traders, Andrew Jackson Myrick, to sell them food on credit. His response was said to be, "So far as I am concerned, if they are hungry let them eat grass or their own dung." But the importance of Myrick's comment at the time, early August 1862, is historically unclear. When Gregory Michno shared the top 10 myths on the Dakota Uprising in True West Magazine, he stated that this statement did not incite the uprising: "An interpreter’s daughter first mentioned it 57 years after the event. Since then, however, the claim that this incited the Dakotas to revolt has proliferated as truth in virtually every subsequent retelling. Like so much of our history, unfortunately, repetition is equated with accuracy." Another telling is that Myrick's was referring the Native American women who were already combing the floor of the fort's stables for any unprocessed oats to then feed to their starving children along with a little grass. Myrick was later found dead with grass stuffed in his mouth. On August 16, 1862, the treaty payments to the Dakota arrived in St. Paul, Minnesota, and were brought to Fort Ridgely the next day. They arrived too late to prevent violence. On August 17, 1862, four young Dakota men were on a hunting trip in Acton Township, Minnesota, during which one stole eggs and then killed five white settlers. Soon after, a Dakota war council was convened and their leader, Little Crow, agreed to continue attacks on the European-American settlements to try to drive out the whites. On August 18, 1862, Little Crow led a group that attacked the Lower Sioux (or Redwood) Agency. Andrew Myrick was among the first who were killed. He was discovered trying to escape through a second-floor window of a building at the agency. Myrick's body later was found with grass stuffed into his mouth. The warriors burned the buildings at the Lower Sioux Agency, giving enough time for settlers to escape across the river at Redwood Ferry. Minnesota militia forces and B Company of the 5th Minnesota Volunteer Infantry Regiment sent to quell the uprising were defeated at the Battle of Redwood Ferry. Twenty-four soldiers, including the party's commander (Captain John Marsh), were killed in the battle. Throughout the day, Dakota war parties swept the Minnesota River Valley and near vicinity, killing many settlers. Numerous settlements including the Townships of Milford, Leavenworth and Sacred Heart, were surrounded and burned and their populations nearly exterminated. Confident with their initial success, the Dakota continued their offensive and attacked the settlement of New Ulm, Minnesota, on August 19, 1862, and again on August 23, 1862. Dakota warriors initially decided not to attack the heavily defended Fort Ridgely along the river. They turned toward the town, killing settlers along the way. By the time New Ulm was attacked, residents had organized defenses in the town center and were able to keep the Dakota at bay during the brief siege. Dakota warriors penetrated parts of the defenses enough to burn much of the town. By that evening, a thunderstorm dampened the warfare, preventing further Dakota attacks. Regular soldiers and militia from nearby towns (including two companies of the 5th Minnesota Volunteer Infantry then stationed at Fort Ridgely) reinforced New Ulm. Residents continued to build barricades around the town. During this period, the Dakota attacked Fort Ridgely on August 20 and 22, 1862. Although the Dakota were not able to take the fort, they ambushed a relief party from the fort to New Ulm on August 21. The defense at the Battle of Fort Ridgely further limited the ability of the American forces to aid outlying settlements. The Dakota raided farms and small settlements throughout south central Minnesota and what was then eastern Dakota Territory. In the meantime steamboat and flatboat trade on the Red River came to a halt. Mail carriers, stage drivers and military couriers were killed while attempting to reach settlements such as Pembina, North Dakota, Fort Garry, St. Cloud, Minnesota, and Fort Snelling. Eventually the garrison at Fort Abercrombie was relieved by a U.S. Army company from Fort Snelling, and the civilian refugees were removed to St. Cloud. Due to the demands of the American Civil War, the region's representatives had to repeatedly appeal for aid before Pres. Abraham Lincoln formed the Department of the Northwest on September 6, 1862, and appointed Gen. John Pope to command it with orders to quell the violence. He led troops from the 3rd Minnesota Volunteer Infantry Regiment and 4th Minnesota Volunteer Infantry Regiment. The 9th Minnesota Volunteer Infantry Regiment and 10th Minnesota Volunteer Infantry Regiment, which were still being constituted, had troops dispatched to the front as soon as Companies were formed. Minnesota Gov. Alexander Ramsey also enlisted the help of Col. Henry Hastings Sibley (the previous governor) to aid in the effort. After the arrival of a larger army force, the final large-scale fighting took place at the Battle of Wood Lake on September 23, 1862. According to the official report of Lt. Col. William R. Marshall of the 7th Minnesota Volunteer Infantry Regiment, elements of the 7th Minnesota and the 6th Minnesota Volunteer Infantry Regiment (and a six-pounder cannon) were deployed equally in dugouts and in a skirmish line. After brief fighting, the forces in the skirmish line charged against the Dakota (then in a ravine) and defeated them overwhelmingly. In Iowa alarm over the Santee attacks led to the construction of a line of forts from Sioux City to Iowa Lake. The region had already been militarized because of the Spirit Lake Massacre in 1857. After the 1862 conflict began, the Iowa Legislature authorized “not less than 500 mounted men from the frontier counties at the earliest possible moment, and to be stationed where most needed”, although this number was soon reduced. Although no fighting took place in Iowa, the Dakota uprising led to the rapid expulsion of the few unassimilated Native Americans left there. Most Dakota fighters surrendered shortly after the Battle of Wood Lake at Camp Release on September 26, 1862. The place was so named because it was the site where the Dakota released 269 European-American captives to the troops commanded by Col. Henry Sibley. The captives included 162 "mixed-bloods" (mixed-race, some likely descendants of Dakota women who were mistakenly counted as captives) and 107 whites, mostly women and children. Most of the warriors were imprisoned before Sibley arrived at Camp Release. :249 The surrendered Dakota warriors were held until military trials took place in November 1862. Of the 498 trials, 300 were sentenced to death though the president commuted all but 38. Little Crow was forced to retreat sometime in September 1862. He stayed briefly in Canada but soon returned to the Minnesota area. He was killed on July 3, 1863, near Hutchinson, Minnesota, while gathering raspberries with his teenage son. The pair had wandered onto the land of white settler Nathan Lamson, who shot at them to collect bounties. Once it was discovered that the body was of Little Crow, his skull and scalp were put on display in St. Paul, Minnesota. The city held the trophies until 1971, when it returned the remains to Little Crow's grandson. For killing Little Crow, the state granted Lamson an additional $500 bounty. For his part in the warfare, Little Crow's son was sentenced to death by a military tribunal, a sentence then commuted to a prison term. Henry Whipple, the Episcopal bishop of Minnesota and a reformer of U.S. policies toward Native Americans, first wrote an open letter and then went to Washington DC in the Fall of 1862 to urge Lincoln to proceed with leniency. On the other hand, General Pope and Minnesota Senator Morton S. Wilkinson told him that leniency would not be received well by the white population. Governor Ramsey warned Lincoln that, unless all 303 Sioux were executed, "[P]rivate revenge would on all this border take the place of official judgment on these Indians." In the end, Lincoln commuted the death sentences of 264 prisoners, but he allowed the execution of 38 men. One of the 39 condemned prisoners was granted a reprieve. :252–259 The Army executed the 38 remaining prisoners by hanging on December 26, 1862, in Mankato, Minnesota. It remains the largest mass execution in American history. The mass execution was performed publicly on a single scaffold platform. After regimental surgeons pronounced the prisoners dead, they were buried en masse in a trench in the sand of the riverbank. Before they were buried, an unknown person nicknamed “Dr. Sheardown” possibly removed some of the prisoners' skin. Small boxes purportedly containing the skin later were sold in Mankato. At least two Sioux leaders, Little Six and Medicine Bottle, escaped to Canada. They were captured, drugged and returned to the United States. They were hanged at Fort Snelling in 1865. Because of high demand for cadavers for anatomical study, several doctors wanted to obtain the bodies after the execution. The grave was reopened in the night and the bodies were distributed among the doctors, a practice common in the era. The doctor who received the body of Mahpiya Okinajin (He Who Stands in Clouds), also known as "Cut Nose", was William Worrall Mayo. The remaining convicted Indians stayed in prison that winter. The following spring they were transferred to Camp McClellan in Davenport, Iowa, where they were held in prison for almost four years. By the time of their release, one third of the prisoners had died of disease. The survivors were sent with their families to Nebraska. Their families had already been expelled from Minnesota. During this time, more than 1600 Dakota women, children and old men were held in an internment camp on Pike Island, near Fort Snelling, Minnesota. Living conditions and sanitation were poor, and infectious disease struck the camp, killing more than three hundred. In April 1863 the U.S. Congress abolished the reservation, declared all previous treaties with the Dakota null and void, and undertook proceedings to expel the Dakota people entirely from Minnesota. To this end, a bounty of $25 per scalp was placed on any Dakota found free within the boundaries of the state. The only exception to this legislation applied to 208 Mdewakanton, who remained neutral or assisted white settlers in the conflict. In May 1863 Dakota survivors were forced aboard steamboats and relocated to the Crow Creek Reservation, in the southeastern Dakota Territory, a place stricken by drought at the time. Many of the survivors of Crow Creek moved three years later to the Niobrara Reservation in Nebraska. After the expulsion of the Dakota, some refugees and warriors made their way to Lakota lands. Battles continued between the forces of the Department of the Northwest and combined Lakota and Dakota forces through 1864. Col. Henry Sibley with 2,000 men pursued the Sioux into Dakota Territory. Sibley's army defeated the Lakota and Dakota in four major battles in 1863: the Battle of Big Mound on July 24, 1863; the Battle of Dead Buffalo Lake on July 26, 1863; the Battle of Stony Lake on July 28, 1863; and the Battle of Whitestone Hill on September 3, 1863. The Sioux retreated further, but faced a United States army again in 1864. General Alfred Sully led a force from near Fort Pierre, South Dakota, and decisively defeated the Sioux at the Battle of Killdeer Mountain on July 28, 1864. Conflicts continued. Within two years settlers' encroachment on Lakota land sparked Red Cloud's War; the US desire for control of the Black Hills in South Dakota prompted the government to authorize an offensive in 1876 in what would be called the Black Hills War. By 1881, the majority of the Sioux had surrendered to American military forces. In 1890, the Wounded Knee Massacre ended all effective Sioux resistance. The Minnesota River valley and surrounding upland prairie areas were abandoned by most settlers during the war. Many of the families who fled their farms and homes as refugees never returned. Following the American Civil War, however, the area was resettled. By the mid-1870s, it was again being used for agriculture. The Lower Sioux Indian Reservation was reestablished at the site of the Lower Sioux Agency near Morton. It was not until the 1930s that the US created the smaller Upper Sioux Indian Reservation near Granite Falls. Although some Dakota opposed the war, most were expelled from Minnesota, including those who attempted to assist settlers. The Yankton Sioux Chief Struck by the Ree deployed some of his warriors to this effect, but was not judged friendly enough to be allowed to remain in the state immediately after the war. By the 1880s, a number of Dakota had moved back to the Minnesota River valley, notably the Good Thunder, Wabasha, Bluestone and Lawrence families. They were joined by Dakota families who had been living under the protection of Bishop Henry Benjamin Whipple and the trader Alexander Faribault. By the late 1920s, the conflict began to pass into the realm of oral tradition in Minnesota. Eyewitness accounts were communicated first-hand to individuals who survived into the 1970s and early 1980s. The stories of innocent individuals and families of struggling pioneer farmers being killed by Dakota have remained in the consciousness of the prairie communities of southcentral Minnesota. The Camp Release State Monument commemorates the release of 269 captives at the end of the conflict and the four faces of the 51-foot granite monument are inscribed with information about the battles that took place along the Minnesota River during the conflict, the Dakota's surrender, and the creation of the monument. Located at Center and State Streets, Defender's Monument was erected in 1891 by the State of Minnesota to honor the memory of the defenders who aided New Ulm during the Dakota War of 1862. The artwork at the base was created by New Ulm artist Anton Gag. Except for being moved to the middle of the block, the monument has not been changed since its completion. In 1972, the City of Mankato, Minnesota removed a plaque that had commemorated the mass execution of the thirty-eight Dakota from the site where the hanging occurred. In 1992, the City purchased the site and created Reconciliation Park. There is purposely no mention of the execution, but several stone statues in and around the park serve as a memorial. The annual Mankato Pow-wow, held in September, commemorates the lives of the executed men, but also seeks to reconcile the European American and Dakota communities. The Birch Coulee Pow-wow, held on Labor Day weekend, honors the lives of those who were hanged. A number of local monuments honor white civilians killed during the war. These include the: Acton, Minnesota monument to those killed in the attack on the Howard Baker farm; Guri Endreson monument in the Vikor Lutheran Cemetery near Willmar, Minnesota; and Brownton, Minnesota monument to the White family, and the Lake Shetek State Park monument to 15 white settlers killed there and at nearby Slaughter Slough on August 20, 1862. The This American Life episode 'Little War on the Prairie' discusses the continuing legacy of the conflict in Mankato, Minnesota. ↑ Kenneth Carley. The Dakota War of 1862. ↑ Clodfelter, Micheal D. (2006). The Dakota War: The United States Army Versus the Sioux, 1862-1865. McFarland Publishing. p. 67. ISBN 0-7864-2726-4. ↑ Kunnen-Jones, Marianne (2002-08-21). "Anniversary Volume Gives New Voice To Pioneer Accounts of Sioux Uprising". University of Cincinnati. http://www.uc.edu/news/sioux.htm. Retrieved 2007-06-06. ↑ Carly, Kenneth (1976). The Sioux Uprising of 1862 (Second edition ed.). Minnesota Historical Society. ↑ Dillon, Richard H. (1920). North American Indian Wars. City: Booksales. p. 126. ↑ Michno, Gregory. "10 Myths on the Dakota Uprising". (2012). True West Magazine. 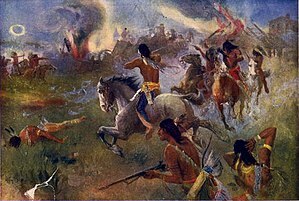 http://www.truewestmagazine.com/jcontent/history/history/history-features/4807-10-myths-on-the-dakota-uprising. ↑ Anderson, Gary. (1983) "Myrick's Insult: A fresh look at Myth and Reality", Minnesota History Quarterly 48(5):198-206. ↑ Furst, Jay (22 December 2012). "Dakota War timeline". http://www.postbulletin.com/news/stories/display.php?id=1518676. Retrieved 27 December 2012. ↑ Burnham, Frederick Russell (1926). Scouting on Two Continents. New York: Doubleday, Page and Co. p. 2 (autobiographical account). ASIN B000F1UKOA. ↑ Soldiers: 3 killed/13 wounded; Lakota: 2 known dead. ↑ Minn Board of Commissioners (October 2005). Andrews, C. C.. ed. Minnesota in the Civil and Indian Wars, 1861-1865: Two Volume Set with Index. Minnesota Historical Society. ISBN 978-0-87351-519-1. http://books.google.com/books?id=UClQRRqJ5lgC. Retrieved 7 May 2011. ↑ "History – Minnesota Infantry (Part 1)". Union Regimental Histories. The Civil War Archive. http://www.civilwararchive.com/Unreghst/unmninf1.htm. Retrieved 7 May 2011. ↑ Rogers, Leah D. (2009). "Fort Madison, 1808-1813". In William E. Whittaker. Frontier Forts of Iowa: Indians, Traders, and Soldiers, 1682–1862. Iowa City: University of Iowa Press. pp. 193–206. ISBN 978-1-58729-831-8. http://uipress.uiowa.edu/books/2009-fall/whittaker.htm. ↑ McKusick, Marshall B. (1975). The Iowa Northern Border Brigade. Iowa City, Iowa: Office of the State Archaeologist, The University of Iowa. ↑ 17.0 17.1 Schultz, Duane (1992). Over the Earth I Come: The Great Sioux Uprising of 1862. St. Martin's Press. ISBN 0-312-07051-9. ↑ Appletons' annual cyclopaedia and register of important events of the year: 1862. New York: D. Appleton & Company. 1863. p. 588. http://archive.org/stream/1862appletonsan02newyuoft#page/n595/mode/1up. ↑ "History Matters". Minnesota Historical Society. March/April 2008. p. 1. ↑ Abraham Lincoln (30 October 2008). The Collected Works of Abraham Lincoln. Wildside Press LLC. p. 493. ISBN 978-1-4344-7707-1. http://books.google.com/books?id=Q4ysBXMyg8UC. ↑ Donald, David Herbert (1995). Lincoln. New York, New York: Simon and Schuster. pp. 394–95. ↑ Carley, Kenneth (1961). The Sioux Uprising of 1862. Minnesota Historical Society. p. 65. "Most of the thirty-nine were baptized, including Tatemima (or Round Wind), who was reprieved at the last minute." ↑ "Human Remains from Mankato, MN in the Possession of the Public Museum of Grand Rapids, Grand Rapids, MI". National Park Service. 2000-04-08. http://www.cr.nps.gov/nagpra/fed_notices/nagpradir/nic0342.html. Retrieved 2007-04-28. ↑ Winks, Robin W. (1960). The Civil War Years: Canada and the United States, Baltimore : Johns Hopkins Press, 1960, p. 174. ↑ 25.0 25.1 Clapesattle, Helen (1969). The Doctors Mayo. Rochester, MN: Mayo Clinic; 2nd edition. ISBN 978-5-555-50282-7. ↑ Records of the Mayo Clinic. ↑ "The Two Sides of Camp McClellan". Davenport Public Library. http://www.qcmemory.org/Default.aspx?PageId=267. Retrieved 2012-06-04. ↑ Monjeau-Marz, Corinne L. (October 10, 2005). Dakota Indian Internment at Fort Snelling, 1862–1864. Prairie Smoke Press. ISBN 0-9772718-1-1. ↑ "family History". Census of Dakota Indians Interned at Fort Snelling After the Dakota War in 1862. Minnesota Historical Society. 2006. http://www.mnhs.org/genealogy/dakotafamily/census1863/indian_index313.htm. Retrieved 2006-12-12. ↑ 31.0 31.1 Bryant, Charles S.; Abel B. Murch (1864). A history of the great massacre by the Sioux Indians in Minnesota : including the personal narratives of many who escaped. Chicago: O.C. Gibbs. ISBN 978-1-147-00747-3. ↑ "Minnesota's Uncivil War". http://news.minnesota.publicradio.org/features/200209/23_steilm_1862-m/. ↑ "Defender's Monument". Brown County Historical Society. http://browncountydakotawarcommemoration.com/uploads/Defender_s_Monument.pdf. Retrieved 17 August 2012. ↑ Barry, Paul. "Reconciliation – Healing and Remembering". http://www.turtletrack.org/Issues99/Co12251999/CO_122599_Reconciliation.html. Retrieved 6 September 2011. Tolzmann, Don Heinrich, German Pioneer Accounts of the Great Sioux Uprising of 1862, Little Miami Pub. Co. (April 2002). ISBN 978-0-9713657-6-6. This American Life: "Little War on the Prairie"